We have all seen them before, those plastic play structures that are meant for small children to climb and slide. They are usually much smaller than a metal or wood play set and do not often have swings. That is until the Little Tikes Tree House Swing Set came along. 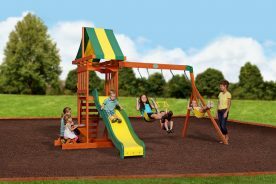 This small-scale playset includes everything kids want in a swing set – slide, climbing wall, imaginative play, and swings – with a size and price tag that fit more yards and budgets than larger wood swing sets. It is also designed for younger kids who might not be big enough or are too scared to try the larger features on a big wooden playset. 1 What is included in the Little Tikes Tree House Swing Set? 2 Who is the Tree House Swing Set for? 3 How Big is it? 4 Where Can I Find the Instructions for the Tree House Swing Set? 5 Where Can I Buy the LT Treehouse? 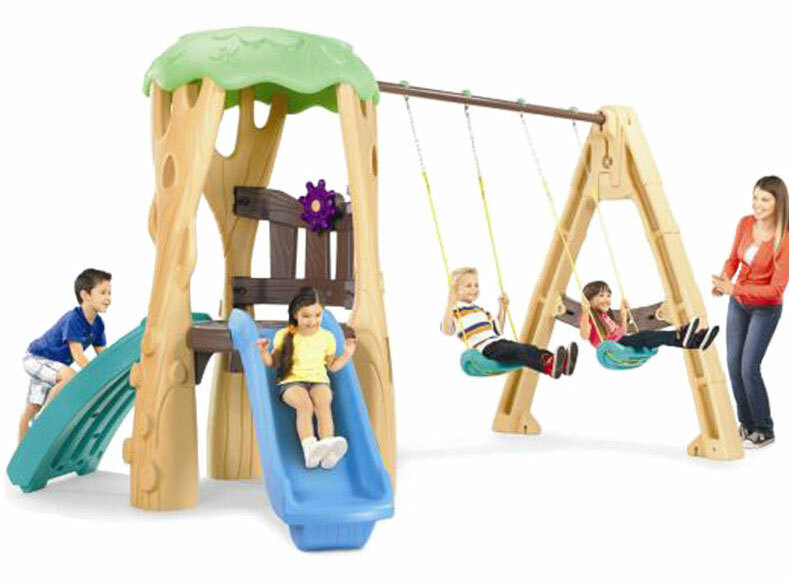 What is included in the Little Tikes Tree House Swing Set? 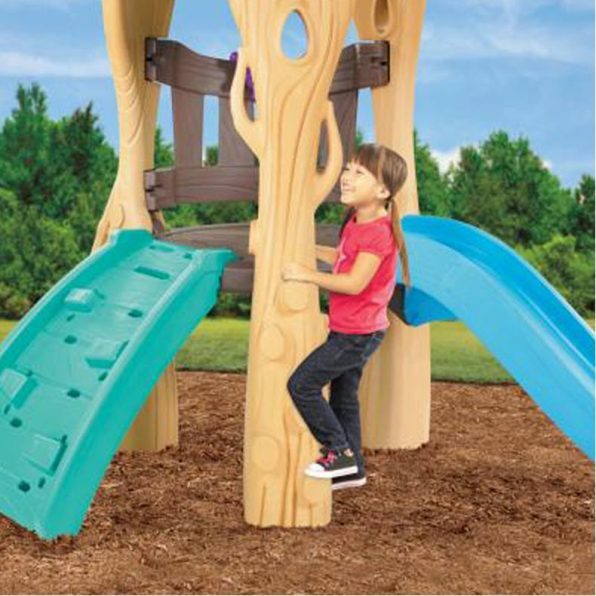 Built to look like a tree and blend into the backyard, the tree house part of this swing set includes a green climbing wall on the back side and a blue slide on the front. Kids can also climb up the “tree” using the grab handles that are molded right in to the trunk. Once they climb to the play platform their imaginations can take them anywhere with the cool purple steering wheel. The two plastic-molded swings give kids an opportunity to get some exercise while they fly through the air. Even though this set is designed with younger children in mind, the swings are a little bit harder to balance on since they are rigid. The chains are also shorter than most and surprisingly cannot be adjusted, so the seat sits a little too high for really young kids. Everything you need for do-it-yourself assembly is included when you purchase this set. There are actually very few pieces compared to most swing sets. The plastic components include about a dozen large pieces that need to be fit together using 2 poles. All of the hardware you need is included along with an anchor kit for stabilizing the set in your yard. Assembly only takes approximately 2-3 hours and requires only 2-3 people. 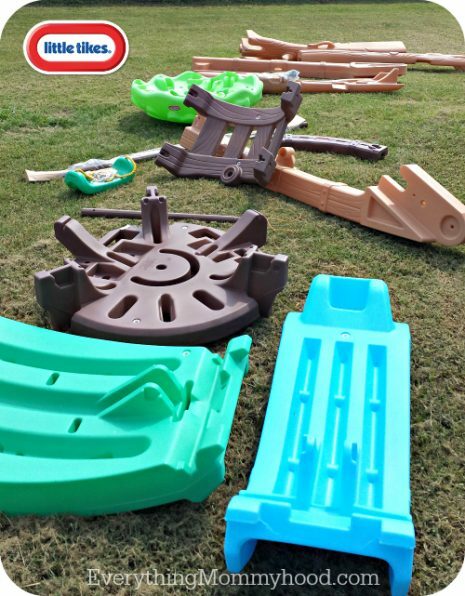 While Little Tikes advertises that this swing set is made in the USA, there are some pieces that are imported and then boxed and shipped within the US. This doesn’t change the fact that this is a durable swing set that is designed to be weather resistant. It not only has an attractive design and colors but will provide years of playtime and fun for your kids. Who is the Tree House Swing Set for? This swing set is definitely one that is designed for younger children. While the age range given is 3-8 years, it is small enough that even an adventurous 2-year-old could still use it safely. The rock wall’s closely spaced hand holds and the length of the slide are perfect for smaller children to learn the fine art of climbing and sliding. With the shorter platform parents don’t have to worry about kids falling from too high. If you’re looking for a playset that all the neighborhood kids can also enjoy then this probably isn’t the set for you. It can only accommodate a maximum of 4 children at a time. Only one child per swing is allowed. The weight limit for each child is up to 81 lbs. Even though most of your small children won’t reach that weight limit, there are always kids who want mom or dad to swing with them. That just isn’t a possibility with this set. Once assembled the swing set is 139 inches long by 93.44 inches wide and is 80.9 inches high. It weighs only 146.7 pounds so it can easily be picked up an moved by two people if needed. The box that the product comes in measures 83 inches long by 25.5 inches wide and is 46 inches high. It weighs 152.7 pounds. When ordering this product online it will be delivered by truck because of its size. Most of the time this means that you will need to be present when it is delivered. You will want to check with the individual retailer that you purchase it from to clarify their shipping policy. 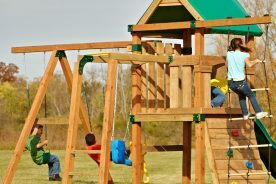 Where Can I Find the Instructions for the Tree House Swing Set? When you order this swing set or purchase it in a store, a detailed instruction manual will be included in the boxes. The manual outlines all of the parts that should be included in a detailed list with part numbers and illustrations. An inventory of the parts should be taken before beginning the assembly process. It is recommended that two people be present to assemble the swing set and it takes approximately 2 hours. With so few parts it is easy to identify what you need to complete each step and the instructions make it very clear which hardware is needed. The instructions do state that all of the holes are drilled where screws need to be placed. However, in many cases there was just an indent and these holes had to be drilled before using the screws to put certain pieces together. If, for some reason, you do not receive a copy of the instruction manual or yours gets misplaced, a digital version can be found here. Where Can I Buy the LT Treehouse? The LT Treehouse is available at several online retailers. Very few retailers actually carry this product in their stores. In the rare case they do you will need a large truck and assistance from another person to lift and haul the box. 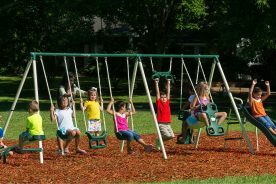 Visit these retailers to purchase the swing set and to find their individual shipping costs and shipping policies. Whether you have smaller children or are just limited on space, you may want to consider this fun, compact-sized swing set. It includes everything a larger swing set has, but is easier to move, put together, and fits into a smaller space and budget. Kids will love all of the imaginative play they can have. You’ll love the sturdiness and the fact that your kids will want to be outside getting exercise.